In this step, you have to fill your correct residential address in the registration form. This step was very crucial when i-tickets were allowed to book on IRCTC website. But from this financial year (2018-2019) i-ticket booking is discontinued. I-tickets booked from the system were sent by courier to the address provided in this form by the user and therefore it was important. Now let's learn about each of these options in details. This is a red star marked option, therefore, it is compulsory to fill it. In this option, you have to provide your flat number or the door number or the block number, whichever you have in your case. Be careful because the only letter like a-z, number like 0-9, spaces and characters", - _ : ) (/ " only are allowed and the total length of text entered in this option should be between 3 to 225 characters. For example, D-1008 is the flat number in the address "D-1008, Ganesh Residency, Pratap Nagar, Jaipur, Rajasthan-302001"
It is an optional option in which you have to provide the street and lane details only if you have in your address. In this option you are allowed to enter the only letter like a-z, number like 0-9, spaces and characters", - _ : ) ( / ". The total length of the text you enter should be between 3 to 30 characters. For example, Ganesh Residency is the Lane in the address "D-1008, Ganesh Residency, Pratap Nagar, Jaipur, Rajasthan-302001"
It is also an optional option in which you have to enter the area and locality details and only if you have it in your address. In this option you are allowed to enter the only letter like a-z, number like 0-9, spaces and characters", - _ : ) ( / ". The total length of the text you enter should be between 3 to 30 characters. For example, Pratap Nagar is the area/locality in the address "D-1008, Ganesh Residency, Pratap Nagar, Jaipur, Rajasthan-302001"
It is a red star marked option and therefore mandatory to fill it. In this option, you have to enter your 6 digit area pin code. For example, 302001 is the pin code in the address "D-1008, Ganesh Residency, Pratap Nagar, Jaipur, Rajasthan-302001"
It is a red star marked option and therefore mandatory to fill it. In this option, you have to enter your residential state. If you have entered your pin code correctly then the system will automatically capture the state related to pin code. For example, Rajasthan is the state in the address "D-1008, Ganesh Residency, Pratap Nagar, Jaipur, Rajasthan-302001"
It is also a red star marked option and therefore mandatory to fill it. In this option, you have to enter your residential city or town. If you have entered your pin code correctly then the system will automatically capture the city related to pin code. For example, Jaipur is the city in the address "D-1008, Ganesh Residency, Pratap Nagar, Jaipur, Rajasthan-302001"
It is also a red star marked option and therefore mandatory to fill it. In this option, you have to enter post office near to your residential home. If you have selected your city then the system will automatically fill the list of the post office in your city or town. It is also a red star marked option and therefore compulsory to fill. In this option, you have to provide the phone number you have at your residence. You can even enter your alternate mobile number also. There is no exact 10 characters validation this option so you can even enter less than 10 characters also. 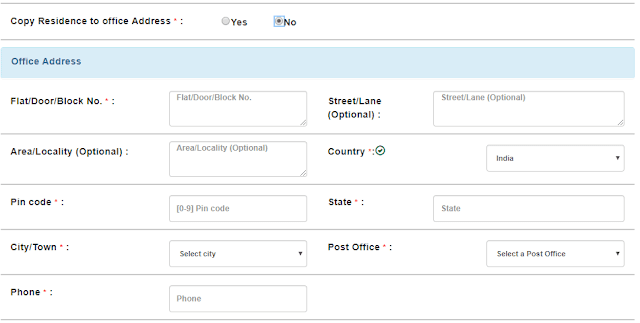 If you want your office address and residential address same then select "Yes" otherwise select "No". Once you select the "No" option then system will be presented with same options as in residential address to allow you to enter your office address. Let's move to the next step of individual account registration process. Do you know about IRCTC pay on delivery service?